My mother had a big influence on me. Not on the specifics regarding the making of art, but for her way of encouraging my interests in it. Having no members of our immediately family professionally involved in the arts, she had no specific advice on how to proceed. She just had a way of quietly removing any stumbling blocks; of letting me know, with out much fuss, that my path was clear. This picture was taken during my first year of art school. Though the scene sums up my mom perfectly, she was patiently posing for me, not caught unaware. I was just learning how to use a large format camera, a slow and cumbersome tripod-mounted "plate camera" requiring a dark cloth to cover the operator so the scene could be previewed on the frosted glass camera back. The preview image of this type of camera is upside down and hard to see. And I was jammed up into the corner of the kitchen because the only lens I had was not very wide, so I missed the focus, which should have been on my mom's profile rather than the cup rack on the wall. I considered it a success nonetheless. Little did I know I would be using a very similar camera to shoot the I Spy books 20 years later. Here is my mom, in the same kitchen, at the same table, on her 99th birthday. I hadn't planned to remake the portrait. We had celebrated her birthday the previous day with all my siblings, and I was hanging around the house the next day when I noticed the light coming in the kitchen at nearly the same angle as it did in 1972. So I asked her to pose once again, though this time I used a hand-held digital camera. I didn't have the original as a reference, so it was only later that I realized things had somewhat rearranged in the 44 years since. I've told my mom many times how much her encouragement meant to me. She always laughs and denies she had influence on me at all. But she did, and it was everlasting. I recently discovered pictures from the very first roll of film I shot. Not an entire roll, but three pictures from the very first time I picked up a camera and walked outside in search of a subject to photograph unsupervised by an adult. They were found mixed together with other pictures taken with the same Brownie camera at a different time, but I was thrilled to discover even the merest breadcrumb-clues of what was going through my head when I first used that essential tool of my eventual profession. I distinctly remember that moment for both the failures and success when the prints came back from the drugstore. The cause-and-effect aftermath lingered in my head years later. But lost pictures are no different than any other undocumented childhood memories: over time, you begin to wonder if certain events of your life actually happened. This would be me on that same day. I'm about 8 years old. I don't remember who clicked the shutter. It is certainly not a selfie, the Brownie camera doesn't focus very close, and it would take a considerable amount of ingenuity for an 8 year-old to rig up a self-timer on a non-electronic camera lacking in any kind of tripod mount. The fail. What in the world was I photographing here? It would appear to be a misfire, or that the subject walked away, leaving only footprints, while I was peering into the waist-level view finder that showed only a tiny, backwards image of the scene. But that wasn't the case. What I was trying to do was capture the hills against the horizon that frequently provided blazing sunsets due to our backyard's Western orientation. Timing is everything when it comes to sunsets – such as waiting for an actual sunset to occur. Color is kind of essential too. Furthermore, the Brownie lens focuses fine at a distance, but doesn't provide the necessary reach in a situation like this. Lesson learned: it takes more than having an emotional attachment to a place to get the feeling across. It looks like I may have called out, "Hey, Allan! ", just before clicking the shutter. Allan was a neighbor I frequently hung out with. The picture is not particularly successful, but at least the subject is immediately apparent. The framing is typical of a beginner photographer – placing a subject's head dead center in the frame. If you were to draw two diagonal lines from the corners of the picture, they would intersect right in middle of the the boy's face. As I would learn years later, compositionally, this is a cardinal sin. That is, unless you're trying to be cheeky, or ironic. Success! I remember jumping out of my skin when I saw this shot, with the snowball in mid-flight streaking towards my other neighbor, Jimmy, the unwitting participant in this photographic enterprise. The thing is, like a GoPro-wielding YouTube prankster of today, I set the whole thing up. I deliberately positioned both of the actors in this little drama. I then urged Allan, a natural athlete (but otherwise a gentle soul), to throw the snowball at Jimmy. With perfect, split-second timing, I got the shot. Back then, of course, there was no internet to share our experiments with the world. This speeding snowball, frozen in time, just went into a drawer, then maybe a box, a closet, an attic. There was little, if any feedback to be had, other than my own solitary musings about what worked and what didn't. I should add, that this was not one of those eureka moments that made me want to become a photographic artist. I had so many other interests at the time: drawing, tinkering, building, inventing, games, sports, climbing trees. It took me through high school, and then college to settle on photography. But a half-century later, I'm still staging my shots. In celebration of National Puzzle Day, I present to you a challenge from the first Can You See What I See? book. 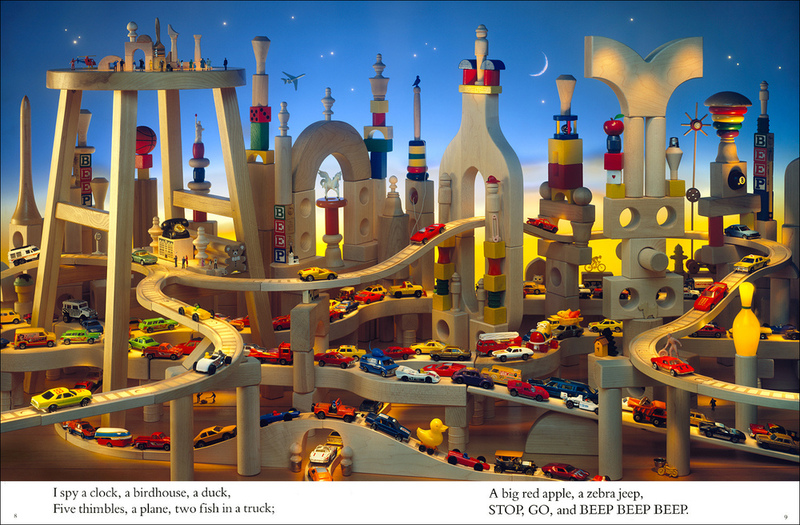 In that book, the rhyming list of hidden objects for each picture ends with a cryptic clue to another puzzle to solve. For this picture, the rhyme ends as follows: "...a girl with a book, a red letter B, and an alphabet path from A to Z!" There are several "dead ends", but only one solution. Can you solve it? Every Christmas, when out of the closets came ornaments, holiday lights, and other decorations, my mother always placed a series of wooden animal cut-outs – a cow, a pig, a rooster, and few others – along the top of our fireplace mantle. What I remember most about the figures is that they miraculously fit together like a jigsaw puzzle. And each year, the challenge of fitting them all together was as fresh as if I'd never seen the puzzle before. It was one of those little family traditions that has always stayed with me, and it's in that spirit I made Can You See What I See? The Night Before Christmas, my search-and-find puzzle adaptation of Clement Clarke Moore's 1823 poem (originally titled, A Visit from Saint Nicholas). In the 10 years since my book was released, I've heard from families that it's unpacked along with the decorations each Christmas. Needless to say, I'm thrilled that it has become a part of a family tradition in some households. In my adaptation, the story is illustrated with pictures inspired by phrases taken from Moore's poem. 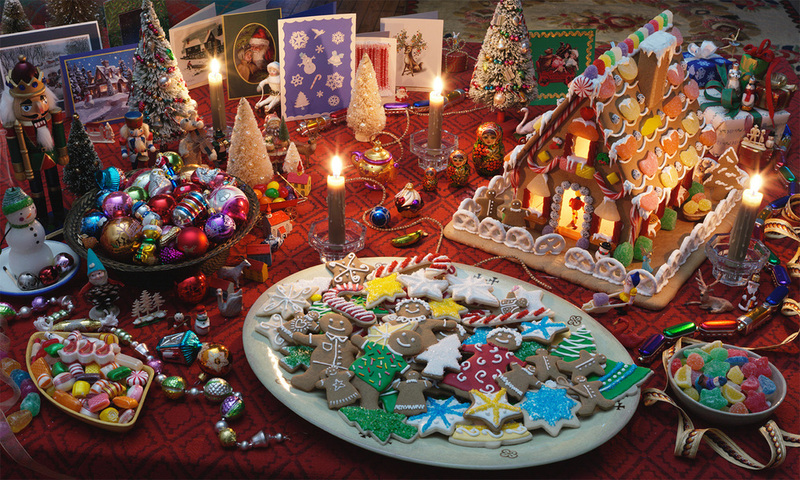 Search-and-find rhymes accompanying each picture prompt readers on a way-past-bedtime quest throughout a house decked out on a magical Christmas Eve. For readers who would like to follow the original story along with the pictures, the full text of the poem (above) is included on the inside cover of Can you See What I See? 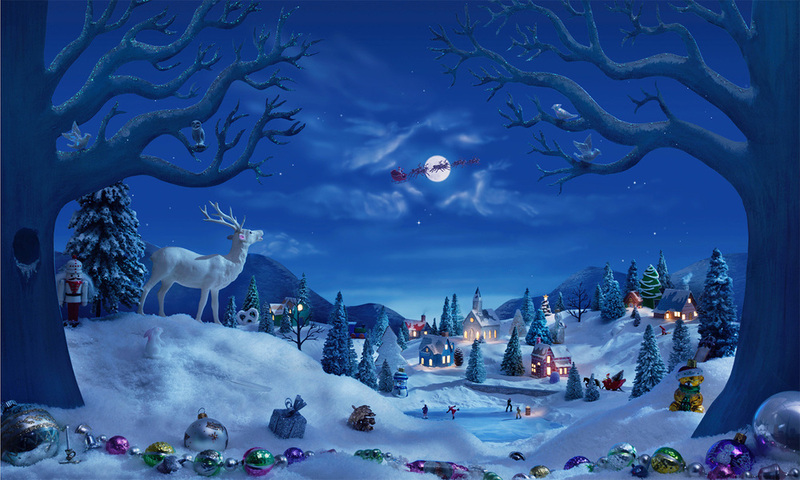 The Night Before Christmas. Click the slide show above to see a few of the illustrations, accompanied by some behind-the-scene set-ups and the amazing team of talented artists that helped me make this book. My book may now be 10 years old, but Moore's original poem has been delighting readers for almost two centuries, and my mother – to whom my book is dedicated – will be celebrating her 98th Christmas Eve this year. Scroll down to learn more about this illusion. Click on the picture above to invert the image and see what appears to be a fully carved deer with smooth rounded edges. Click again and it goes away. The seemingly irregular wooden shapes, are in fact the negative spaces of a leaf-and-deer motif derived from an early 20th century ironwork fireplace screen (pictured below). When inverting the image, the figurative design is upright and therefore more apparent, but the soft shadows of the seemingly random pieces on the dark wood give a distinct impression of a smooth rounded-edged carving. This is most likely due to our being conditioned to seeing objects most often in light shining from above with shadows falling below. – an assumption that can occasionally work against us. The woodworking tools help us properly orient the workshop setting – and also provide a visual joke: they are not proper tools to make the square edged pieces on the table, but rather more appropriate for the rounded-edge carving of our imagination. The design was projected directly from the 8x10 camera (left), then traced on to paper to make the pattern needed for the wooden shapes. The motif was derived from an early 20th century fireplace screen (left). A glass screen was dabbed with black paint to help control the shadows. Phantom of the Forest, originally published in Walter Wick's Optical Tricks (1998), is similar to an illusion you may have seen before. 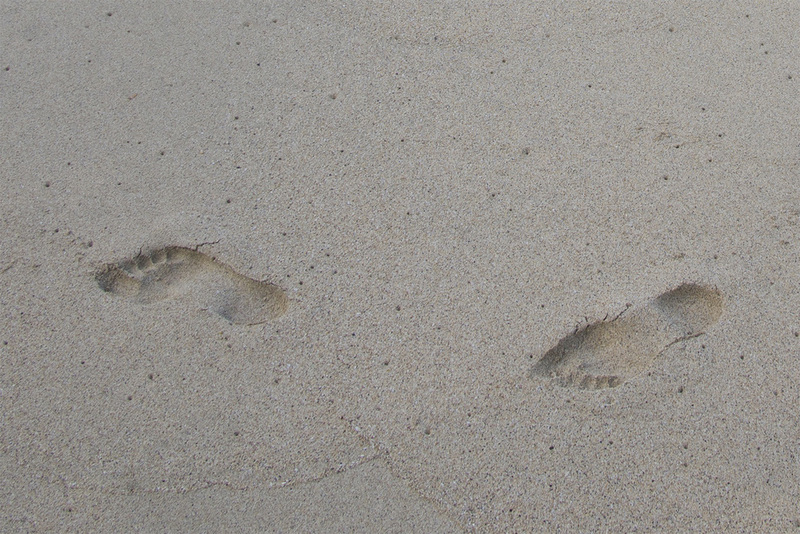 If you photograph footprints in the sand, and turn the picture upside down, the impressions will appear to pop out. Click on the picture above to try it out. Without other objects in the picture to provide proper orientation, it can be hard to see the footprint impressions properly. "How did you do that?" was once a typical question from readers confronted with a frequent motif of mine: toys seemingly caught on camera in mid flight. "Did you drop the toys and take a quick picture?" was one suggested solution. Recently, a long-time fan, having seen how intricate my film era process was for creating Yikes! (above) asked, "Is there an easier way to make objects appear to float?" I can safely assume the questioner was thinking of the new age of digital tools. As much as I've labored for years using "in-camera" techniques (the term for un-retouched film photos), I've been fully digital since 2004, employing high resolution cameras and powerful editing programs like Photoshop. Perhaps it's time to address the question of film vs. digital effects. In doing so, I'll compare the film-era Yikes! from I Spy Fantasy (1994), and the digitally captured Toppled, from Hey Seymour! (2015). 50 megapixel digital camera (far left) with 8X10 film camera; Ektachrome T64 transparency film. Above are the two cameras in question: The 50 megapixel medium format digital camera (left) used for Hey, Seymour! (2015), and the 8X10 view camera I used in the film era. 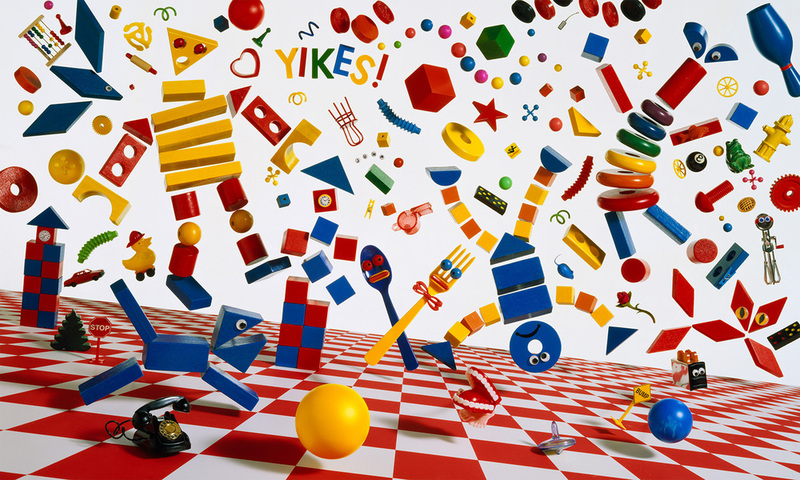 At right is the original film of Yikes!. 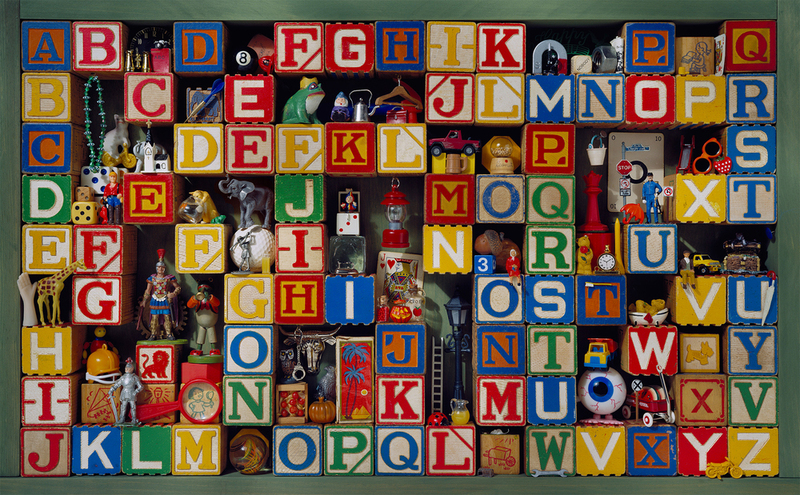 The I Spy series, produced in the 1990's, were all shot with large format film cameras. The vast majority of those images, includingYikes!, were sent to the printer without any post production retouching. Yikes! began with an idea to make a dream-like image of gravity-defying toys. Wanting an appropriate ground for the geometric block components, I choose a checkerboard pattern, painted in "forced perspective" to create an illusion of depth greater than is actually in the scene. This had the added benefit of keeping the floor from extending too far away from the camera so everything could remain in focus. Next, to create the cartwheeling robot-like figures, I experimented with arranging blocks on a table, recording the designs with SX-70 Polaroids (above right). With the figures worked out, I could begin to anchor them to a vertical sheet of clear glass using hot melt glue and adhesive putty. The three larger Polaroids were made using an adapter in the film camera. In this way I could "instantly" check what the camera was seeing as the composition progressed. Above, you can see the set from the back of the glass, the camera is behind me to the left. Some objects could be attached directly to the glass, others were mounted on aluminum armature wire so I could play with their relationships in 3D space. A mix of small and large objects were chosen to further the illusion of depth. Naturally, I was quite constricted by this set up, having to work out the composition while keeping each object's glue or wire support in a narrow blind spot behind each object. Moving the camera left or right even just an inch would have exposed the hidden supports. A large white screen provided the backdrop to the primary colored props, and canceled out reflections in the glass due to its brightness. Fast forward 20 years later. Toppled is a two part sequence: stacks of overstuffed containers in the first scene, everything flying apart in the next. 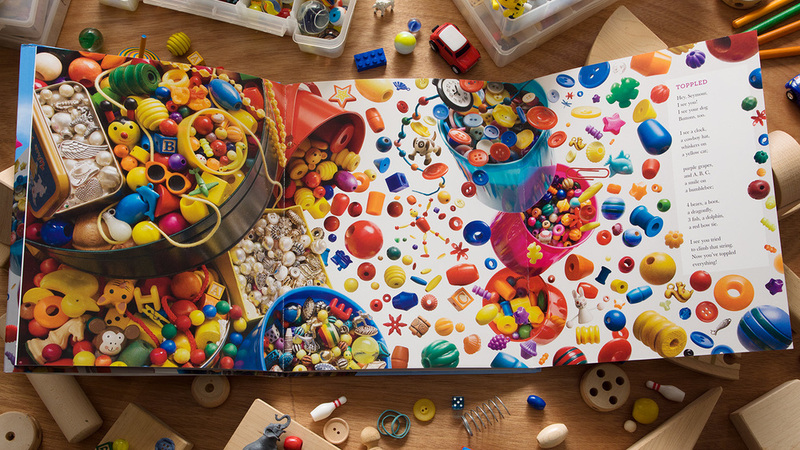 The first photo is an ordinary still life requiring no cut-and-paste Photoshop tricks. However, even with straight still life, shooting digitally has many advantages. I can look at a live view of what my camera is seeing as I arrange the set-up, saving frequent trips up and down a ladder to look through the camera; there's no more Polaroid or film processing (and related expenses) to contend with; I can forensically examine the digital files at any step of the way with a push of a button. And best of all, I can achieve the deep focus required of my images through a process called "focus stacking," a computer process that stitches together the sharpest parts of images shot at different focus points into one seamless whole. No forced perspective set-building necessary. Arranging props in a scene such as this is a joy. With gravity on my side, everything at arms length and no arduous physical conditions constricting me, I can go for hours at a clip, sculpting piles of stuff into a landscape of intersecting shape, form and color until my eye wanders endlessly among the details. In such conditions, how the image is captured has little bearing on the success of the arrangement – though the time-saving work flow enabled by digital preview, capture and post processing, certainly helps. For the second part of the sequence, I tilted the three central containers precariously and exaggerated the distance between them using hidden supports to hold them in place. Next, I shined a light from underneath the glass table top, illuminating the thin white plastic sheet that covered the glass (click on picture above to turn on and off backlight). 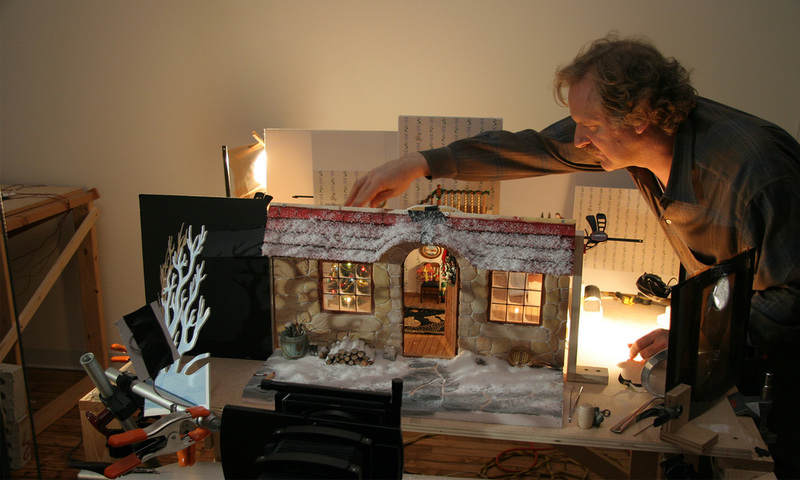 This set up was the basis for the second part of the sequence and for photographing subsequent groupings of loose objects which were later composited together in Photoshop to complete Toppled. So, is it easier now? In so many ways, yes. Then again, with every task made easier, a new challenge beckons. With its 29" fold-out sequence and multi-element composition, Toppled was every bit as time consuming and intricate as Yikes! But while I now have digital age tools to make things "easier", I also now have digital age readers brought up in an effects saturated age. With that in mind, for Toppled, I endeavored to provide readers with something more to observe; something more to think about: in they act of opening the flap, it's they who activate the perceptual change from solid surface to free fall. Thus, with the cause and effect close at hand, the emphasis can shift from the mechanics of behind-the-scenes rigging, to the mechanics of seeing – and the very nature of illusions. Many thanks to the fan who inspired this post. Floor Games, by H.G. Wells, published by J.M. Dent and Sons, London 1931 (first published in 1913), 84 pages. "The jolliest indoor games for boys and girls demand a floor, and the home that has no floor upon which games may be played falls so far short of happiness." There are no rules for these kinds of games. This is free-associative world-building, but he does hint at ways to keep the peace among the players: "We distribute our boards about the sea in an archipelagic manner. We then dress our islands, objecting strongly to too close a scrutiny of our proceedings until we have done." In another chapter entitled "Of The Building of Cities" he writes, "We always build twin cities" because both sons want to be "lord mayors and municipal councils." It's of particular interest to me that the book is photographically illustrated. Text pages contain whimsical drawings in the margins by J. R. Sinclair. There is no photographer credited but it appears to be Wells himself behind the camera: "As I wanted to photograph the particular set-out for purposes of the illustration of this account, I took a larger share in the arrangement than I usually do." In a close-up photograph of the "Wonderful Islands" (above), Wells playfully notes his sons' Plasticine monsters guarding a temple, calling them "remarkable specimens of Eastern religiosity," but then adds, "They are nothing, you may be sure, to the gigantic idols inside, out of reach of the sacrilegious camera." And with that, he gets to the very essence of imaginative play, when the deep recesses of the creative mind conjure images no toy could hope to emulate; no camera could hope to capture. While the Wells family floor games are accessorized with toy soldiers, figurines, wind-up train sets, miss-matched farm animals and other store bought items, Wells is disparaging of the "incompetent" toyshops. "We flatten our noses against their plate glass perhaps, but only in the most critical spirit." He preferred an over-sized collection of large wooden "bricks" procured from a Good Uncle who Wells praises far above the "common levels of humanity" (see statue erected in his honor above). Wells then goes on to describe in detail the dimensions of the components, including sets of full, half, and quarter size blocks. He also describes the various sizes of wooden boards and planks he had fashioned to complete the modular system. Those familiar with my photo illustrations would know that "floor games" are a frequent theme. Others familiar with educational toys would recognize that Wells' "bricks" are a precursor to "unit blocks" - the plain maple blocks often found in pre-school classrooms. However, it was not due to Wells that unit blocks first came into my studio. That distinction belongs to another advocate for imaginative play, Jean Marzollo. It was Jean who recommended I use them for a back-to-school themed poster for Let's Find Out, a kindergarten magazine she edited at the time. When we later collaborated on the I SPY books, the blocks followed, along with their many benefits. Because the plain wooden shapes lack any prescribed function, they can become the building blocks for virtually anything – a castle, a multi-tiered toy-car traffic jam, even a machine that pops a balloon. The long, extended play sessions of my youth were essential to the creator I am today. It helped exercise those world-building and problem solving pathways in my brain, and in turn enabled access to those deep recesses of the creative mind. Like learning a second language, it sinks in more thoroughly when you start young. 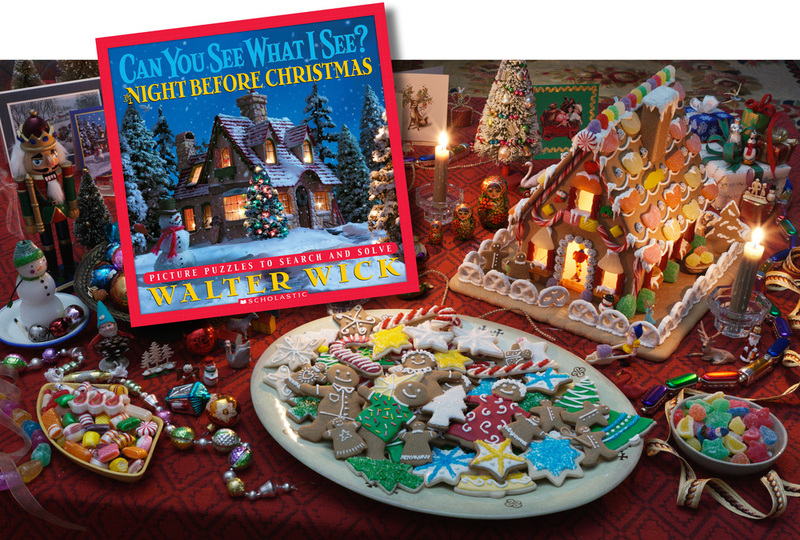 I'm thrilled that the college-aged Robert Carlson, who only recently discovered Wells' opus to imaginative play, recognized the kinship to the I SPY books of his youth. I was even more thrilled to learn I SPY helped inspire Robert and his siblings to create long-running "floor game" adventures of their own – with some even utilizing the roof! You can see them for yourself on the YouTube channel he still maintains. Thank you, Robert, for inspiring me to revisit Floor Games! To a project-oriented, scientifically curious individual such as myself, it's a delight to flip through its fragile pages and peruse its 900 illustrations. On one such occasion in the 1980's (when I first started the collection), I came across an experiment showing an improbably stacked set of dominoes. After providing a few tips on how to build the stack, the text reassures us the stack will "remain in equilibrio provided that the perpendicular drawn from the center of gravity passes through the base of sustentation of the lowest domino." And with that, the short chapter on The Equilibrium of Bodies concludes, but not before announcing, "In our next section we shall deal with the Density and the Movements of Gases." However, we're not nearly done with Equilibrium of Bodies. Would that trick really work? That's the question I asked back in the 1980's. As it happens, I had an authentic, 19th century domino set in my studio – props left over from a photo-puzzle I'd created for GAMES magazine – and so began my foray into the world of "pleasing experiments and attractive pastimes". I set about carefully stacking the ivory and ebony tiles, ready to document the moment with the "Instragram" device of the day – a SX-70 Polaroid camera. It worked! The trick, as noted in Popular Scientific Recreations, is to temporarily support the stack with three dominoes, then gently remove the two outer ones and place them on top. I used a set of double-nine dominoes, drawing from a total of 55 tiles, but a standard set of 28 double-six dominoes makes for a more effective parlor trick as the entire set would be stacked on a single domino using the above configuration. In another book, Magic at Home (1891), I found another balancing experiment, this one with a bit of inherent jeopardy, as failure would result in broken eggs. As I recall, I may have lost a couple, but I eventually succeeded, as you'll see below. I used a raw egg, and heavy-handled forks helped to keep the center of gravity low, adding stability to the "system". You may have noticed the similarity of the engravings in both books. That's because many British and American popular science books were following similar trends going on in France, some of which borrowed from the same French publications. I have (unconfirmed) suspicions that the engravings were based on photographs, so with that in mind, I deliberately imitated the engravings viewpoint and lighting as much as possible. This time, the film of choice was 8"x10" Ektachrome. My book collection quickly became, and continues to provide, a deep-well source of inspiration. My 1997 book, A Drop of Water: A Book of Science and Wonder, quotes from Arabella Buckley's The Fairy Land of Science of 1890, and derives experiments from C.V. Boys' 1896 classic, Soap Bubbles (more on those books in future posts). In 2007, I made "Balancing Act", a photograph clearly inspired by the early books, showing a 117 (unbreakable) toys balancing on a single LEGO® brick. Note the heavy pool balls hanging at the bottom. Like the forks, their weight and position help stabilize the structure by lowering the center of gravity. 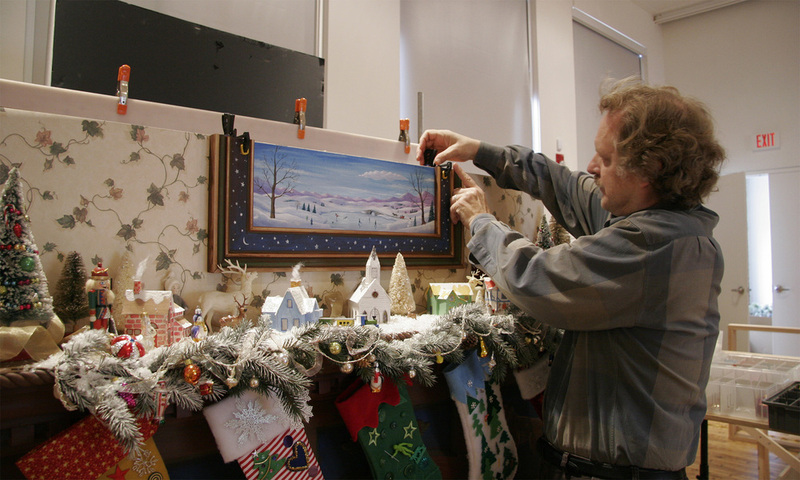 The resulting photograph was a gift to the Connecticut Science Center, where I served as a trustee. It's been on display since the center's opening. A short, behind-the-scenes "Balancing Act" video can be found here. Balancing Act ©2007 Walter Wick pigmented inkjet print, dia. 37.5"
A version of "Balancing Act" was adapted for my fold-out book, Hey,Seymour! (2015). Reimagined as "Balancing Tricks" (pictured below), this very tall picture is accessed in the book on a page that shows a smaller version of the stack, which then doubles in size to 20" when the page is unfolded vertically. The book features a search & find game, not hands-on instruction. But my thought in making this picture, was the search need not be within just any pile of toys if the same toys could be reconfigured to inspire the question, "Would that trick really work?" My apologies to the keepers of any orderly household now enduring the chaos of flying toys (here's a tip – start with dominoes). However, I'm a lifelong advocate of learning through play. I need to look no further than my bookshelf for validation. The books may be a century old, but the forces that keep my stack of toys "in equilibrio" never go out of style. Learn more about Hey, Seymour!